The pattern is ready! Bear with me, it's my first time doing this sort of thing. Sand River was inspired by the sand-like colors in the (LL Lion and Lamb) Aslan colorway. 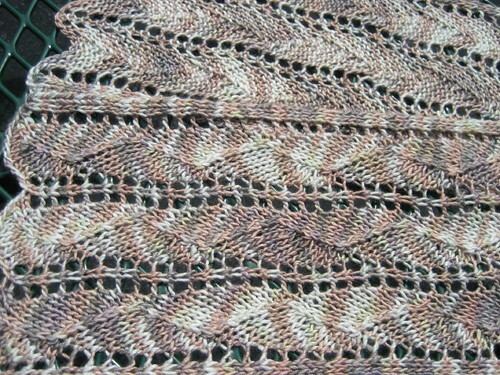 The stitch pattern is reminiscent of sand dunes or a winding river. This pattern is perfect for beginning lace knitters; the pattern is easy to memorize and quick to knit. 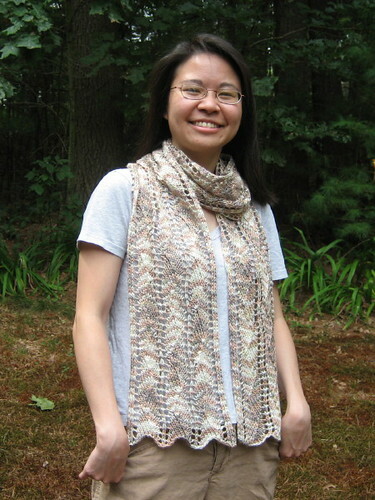 The scarf version takes just 2 skeins of Lorna's Laces Lion and Lamb (or substitute your favorite silk/merino yarn); the shawl version uses 4 x 80g skeins of Seacoast Handpainted Yarns Andee. If substituting, choose a yarn that has some drape. Send payment via PayPal to twoleftneedlesATgmailDOTcom (replace AT and DOT with symbols); pattern will be emailed when payment is confirmed. Thanks again to Kate for test-knitting. I saw her scarf today and what you can't tell from her photos is how soft and drapey it is! It's knit in Lorna's Laces Shepherd Worsted; it's been through the washer, partway in the dryer and then laid out to dry. The pattern still shows up nicely, so it's a nice "wash and go" alternative to merino/silk! See what I mean about the pooling? And this is alternating 2 skeins. 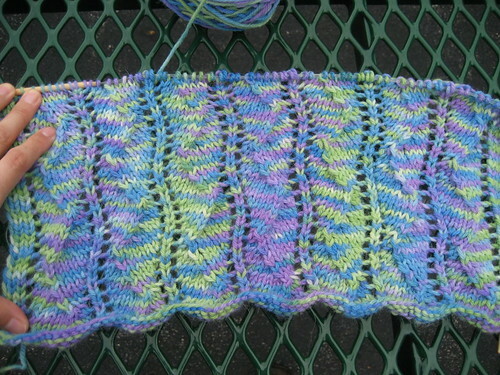 The pooling has started to change, though. So what do you think of the colors? Do you like them? Would you wear them? They're not quite my colors, a little too limey on the green. I like how it's knitting up, though. It's a fairly soft wool/alpaca and I'm not sure you can see it in the photo, but the stitch pattern shows nicely in it. I'm contemplating overdyeing with, say, a bit of red to change the tone. I hate to do that to yarn that's already handpainted, though. I'd love to hear your thoughts.